Welcome back. I have been very busy writing my children’s novel – see later – which is why I have neglected my blog. Sorry! 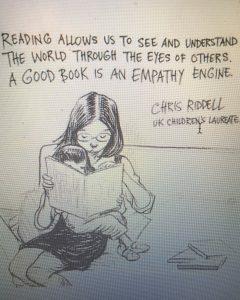 I have recently become aware that there is such a thing as an ‘Empathy Book List’. I looked at the list today and there are some excellent-sounding books. A while ago, I also read about someone sending her daughter to an ‘empathy session’. I’m not sure whether this is heart-warming or not. It probably is. . .
Clearly empathy is heart-warming but is it strange that such activities/book lists are necessary? Perhaps the following comment by Empathy Lab UK explains the need for current attention being paid to empathy. I remember feeling empathy with the majority of characters I used to read about as a child. It seemed to be a necessary part of carrying on reading about a character – even, for example reading about cross young Mary in ‘The Secret Garden’. I felt very much for her and her reaction to her circumstances – the loss of her parents in India and being sent to a strange house in Yorkshire. I also remember feeling greatly for Katy in ‘What Katy Did’. She had an accident and seriously hurt her back and had to strive to recover from this. The love/empathy of her grown-up Cousin Helen and her loving sister Clover helped her through the ordeal. There are many books written today in the list by the Empathy Lab. 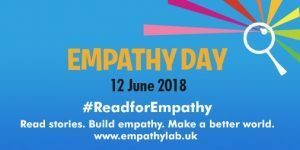 There is even an Empathy Day. I have at last completed writing my first children’s novel. ‘Saving Willowfield’. (Please note: Looking for a publisher. . ) The main character Abigail cares so much for her twin brother Gabriel who is suffering from a serious disease of the hip (Perthes disease). I hope her love for her brother and her love of their grandparents’ farm come across and will move the children who read the story. Another matter that requires empathy in my novel is the plight of farmers of small farms struggling to make ends meet. Abigail and Gabriel are desperate to think of a way to save their grandparents’ farm from having to be sold. It means so much to them. They love their grandparents and visiting the farm is a big part of their lives. I hope the reader will share the children’s concern and salute their persistence. As long as it involves the reader enough, a fictional story about identifiable characters can bring care, concern and invoke feelings of empathy. It seems as if this is something urgently sought after in today’s digital technology and internet-obsessed society.